After having a night in Myrtle in Laura and starting to get our possessions back into some sort of order we headed onto the town of Mareeba for a night before heading back into Cairns for a couple of weeks. 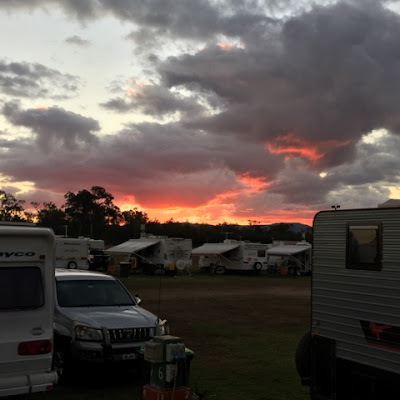 I had heard some good reports about staying at the Mareeba Rodeo grounds so that was where we decided to lay our heads for the night. At $18 for the night and with very clean showers and toilets it was a very comfortable place to stay. There were a few others joining me in this sunset tonight!! But we certainly did get a surprise as we drove through the gates and saw over 100 caravans all set up. I asked the caretaker if this was unusually busy and his reply was "Oh no we only have 120 here, next month will be over 250". Certainly is a very popular place. Mareeba is situated in the northern part of the Atherton Tablelands and the countryside is extremely picturesque. The next morning our drive down into Cairns was an interesting one to say the least. The highway to Kuranda was great but then it got quite narrow and extremely windy as we descended down the mountain. As if that wasn't enough we also had to contend with drizzly rain and fog (or cloud cover) so thick you could only see a couple of metres in front of you. I am so so glad Shane was driving as I don't think I would have coped very well driving down there with Myrtle on the back. I wish I had taken some photos but my mind wasn't on my camera at the time. 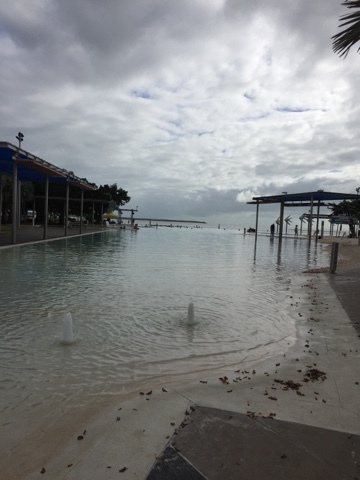 But in the end we arrived at our caravan park in Cairns safe and sound. I have now been in Cairns for 7 days and today is only the 2nd day it hasn't absolutely poured - but it's still drizzling. Shane is in Darwin for his annual boys week away. We won't be leaving here for another week, hopefully it stops raining so I can get out and take some photos. I think I'm getting a bit of cabin fever!